I paid 10 cents for a box. John Jensen...not only because of choking hazard but as with everything else it reduced their cost for greater profits. They probably had to do away with the little prizes because they were probably considered a choking hazard. Hence the little paper things now. 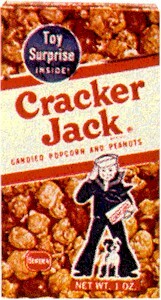 They use to have great little toy prizes inside of The "Crackerjack"
boxes..now..you don't get any real good prizes in the damn "CJ"
"Candy coated popcorn, peanuts and a prize, that's what you get in Crackerjacks". Today they hardly use any peanuts !!!! now packaged, in Canada anyway, in of all things BAGS! Just wrong! "Nut" on one end of the box, and "Toy" on the other end.